As part of its iPad lineup update announced today, Apple introduced the second-generation iPad mini, which as expected is equipped with a 7.9-inch Retina display with a resolution of 2048x1536, matching the resolution of the full-sized Retina iPad. The Retina iPad mini is slightly thicker than the original iPad mini, measuring in at 7.5 mm thick and 0.73 pounds (0.75 pounds for cellular-capable models) compared to 7.2 millimeters and 0.68 pounds for the original generation. The new iPad mini will launch on an unspecified date in November and will be available in both white/silver and black/space gray options. Internally, the Retina iPad mini includes a 64-bit A7 processor, M7 motion co-processor, and an upgraded 5-megapixel rear iSight camera with a backside illumination sensor and 1080p HD video capability. Meanwhile, the front of the device now features a new FaceTime HD camera with larger pixels that is also accompanied by dual microphones. The new iPad mini also now features multiple-input and multiple-output (MIMO) technology that offers up to 2x faster Wi-Fi, with both 802.11a/b/g/n Wi-Fi and LTE cellular models that available with up to 10 hours of battery life. Apple has raised the price of the iPad with the inclusion of a Retina screen, and will offer it in 16, 32, 64, and new 128 GB models, beginning at $399 in the United States. In addition to offering the Retina iPad mini, Apple will continue to sell the existing iPad mini at a lower price, offering only the low-end 16 GB model at $299 for Wi-Fi and $429 for Wi-Fi + Cellular. The first-generation black models will also see a shift from the previous slate shell to Apple's new space gray color. The new iPad mini will be available next month, while the first-generation models at $299/$429 are available immediately. So the updated iPad mini gets a price increase of 21 percent compared to the last one. That was pretty unexpected. When the full sized iPad got retina display, the price stayed the same. The only thing I think is weird is keeping the iPad 2 for $399. Who's going to buy that when they can get a retina Mini with all the upgrades for the same price? No thanks! The price of tablets are going down not up. Typical bad Apple move. 400 bucks for a 7 inch? 500 for a 9 inch? And Apple still producing iPad 2 for 400 bucks? Is Apple back in 2010? I understand why Apple products often carry a premium price over Nexus devices. or many competition device. 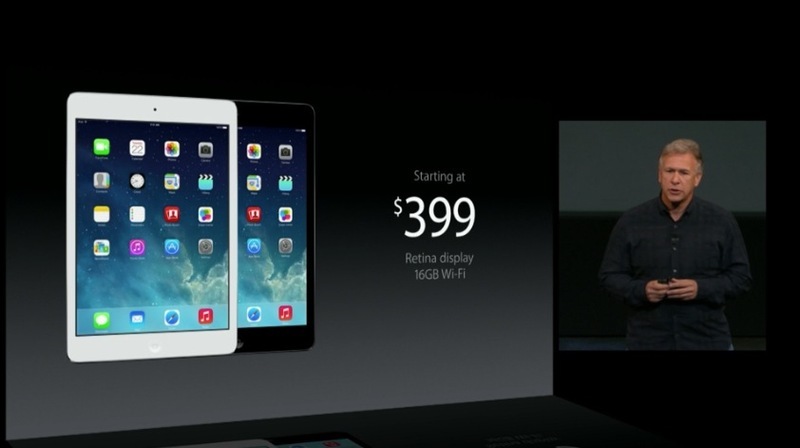 But $399 for essentially an 8" tablet is a tough pill to swallow, EVEN if it's a really damn nice looking tablet. people were iffy at $329 for the mini. this is another $70. if you're not someone tied to iOS system and are looking with price as a major factor, the Nexus 7 (2013) just became that much more appealing. And the old Mini was already on sale for $299 on and off for about 6 months, so Apples price drop is nothing special (guess Wallymart might sell them for $279 some day soon). And the $399 for the Hi-Def will be a huge turn off when someone looks at a hi-def Android tablet for half that (yes, not as good, but still). $399 though.... eeehhhhhhhh, thats a tough pill to swallow.